Mark your calendars for Saturday, Oct. 6, as Embry-Riddle Aeronautical University and the City of Prescott co-host Wings Out West, featuring an aerial demonstration, numerous static aircraft displays, an aeronautical tech fair, and a regional fly-in at Prescott Regional Airport, Ernest A. Love Field. A variety of food vendors and concessions will also be on site. Headlining this year’s show for the second consecutive year is Embry-Riddle airshow pilot Matt Chapman. 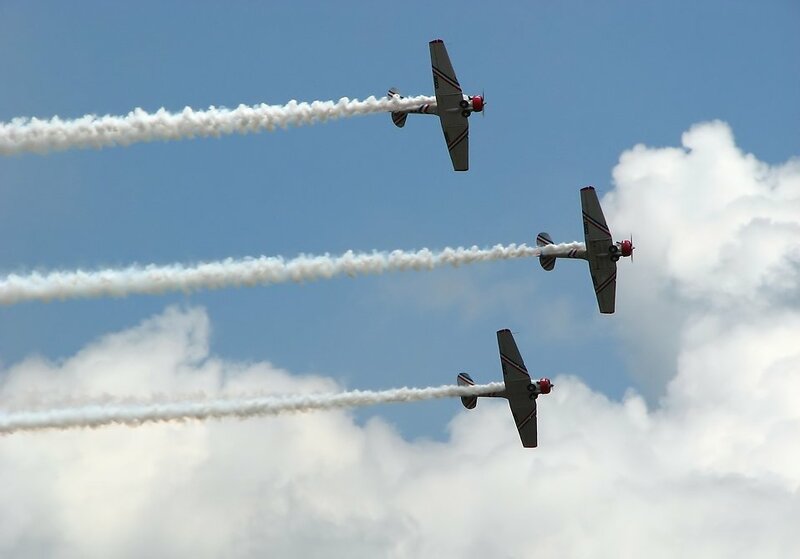 Attendees will enjoy additional performances from Bill Stein, Rob Holland, Steve Bennett, Cindy Irish, Gary Rower, the Immortal Red Baron, and Embry-Riddle’s own 12-time national champions, The Golden Eagles Flight Team. This year’s airshow will also include a tribute to Ernest A. Love, one of Prescott’s original hometown heroes, who was shot down over France during World War I and later died in captivity. There will be an aerial reenactment of the fateful dogfight that eventually took E.A. Love’s life 100 years ago. There will also be comments from Prescott Mayor Greg Mengarelli, and an E.A. Love display hosted by the City of Prescott. For more information about other activities honoring E.A. Love, go to www.prescott-az.gov. Gates at Prescott’s Ernest A. Love Field will open to the public at 9 a.m., with the aerial demonstration taking place from 10 a.m. to noon. Admission and parking will be free. Attendees should use the main airport entrance off of Highway 89. There will be ample signage and personnel directing traffic to designated airport parking areas. For additional information about parking, including maps and more detailed airport information, go to www.PRCAirport.com. This same United Express CRJ200 aircraft is scheduled to be on display during the Wings Out West airshow. For additional information on Wings Out West performers, visit: http://prescott.erau.edu/octoberwest/wings-out-west-airshow/index.html. Jason Kadah, Communications Director, Embry-Riddle Aeronautical University, Prescott, Ariz.; Office: (928) 777-6731; jason.kadah@erau.edu. John Heiney, Community Outreach Manager, Prescott Tourism Office, Prescott, Ariz.; (928) 777-1220; john.heiney@prescott-az.gov. At 5,200 feet in elevation, adjacent to the Prescott National Forest, one of the largest pine forests in the country, Prescott enjoys a mild four season climate and is a popular outdoor recreation destination that also boasts a rich history and a thriving arts community. Prescott is home to Ernest A. Love Airfield, one of the busiest airports in Arizona. Prescott also boasts three institutes of higher learning, including Embry Riddle Aeronautical University, Yavapai College, and Prescott College. Prescott was recently named one of the top Happiest and Healthiest Communities in the nation by Time Magazine, and number one place to live in the Southwest by Sunset Magazine. For more information go to www.prescott-az.gov or www.visit-prescott.com.